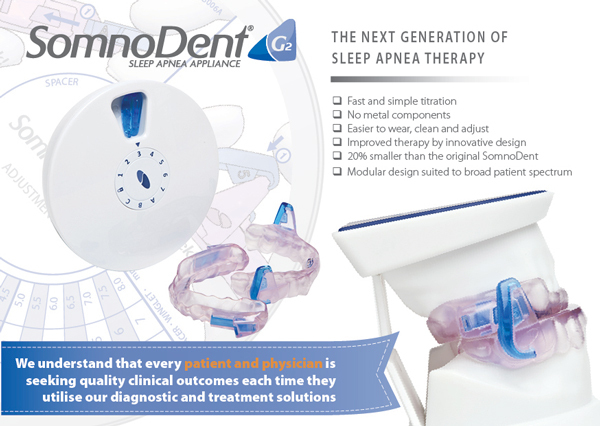 Our skilled dentists are proud to offer the residents of Hoboken and the surrounding areas the option of SomnoDent®, a sleep appliance that can treat your sleep apnea more comfortably. If you’re curious about SomnoDent, ask one of our dentists and we’ll be happy to discuss it with you. You deserve a good night’s sleep, and you deserve a customized, comfortable sleep apnea treatment. Please call 201-792-9400 today to schedule your sleep apnea consultation at our Hoboken dental office. When considering how to treat your sleep apnea, our dentists will carefully evaluate your unique sleep disorder symptoms and severity. SomnoDent will not be right for everyone, and our dentists will ensure that any treatment is appropriate for your specific needs. If you are a good SomnoDent candidate and you, in consultation with your dentist, choose that option for your sleep apnea treatment, you can rest assured that this sleep appliance will go a long way toward restoring you to the pleasant nights you deserve. First, our dentist will carefully take a computerized bite that decompresses the TMJ and establishes a balanced bite position for improved treatment effectiveness and comfort. Every SomnoDent appliance is custom-made for our patients’ unique needs, and yours will be no exception. We will then send this impression off to the company that manufactures the SomnoDent, where your custom appliance will be constructed. This will take a couple of weeks. Once your appliance is shipped to us, we’ll contact you to arrange an appointment. At your appointment your dentist will show you how to wear your SomnoDent and how to clean and care for it. And that’s it. 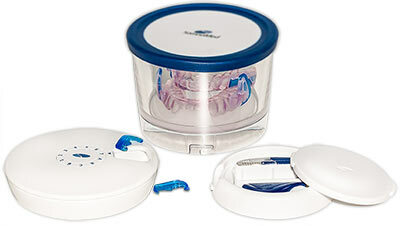 You go home with your new SomnoDent and a new, effective treatment for your sleep apnea. These sleep appliances typically last about 5 years. The SomnoDent is really quite simple. It’s essentially two plates, one for your upper teeth and one for your lower teeth, and they are worn over your teeth and gums. 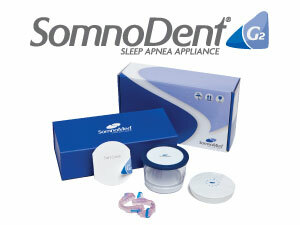 We offer both the original SomnoDent and the new SomnoDent G2. 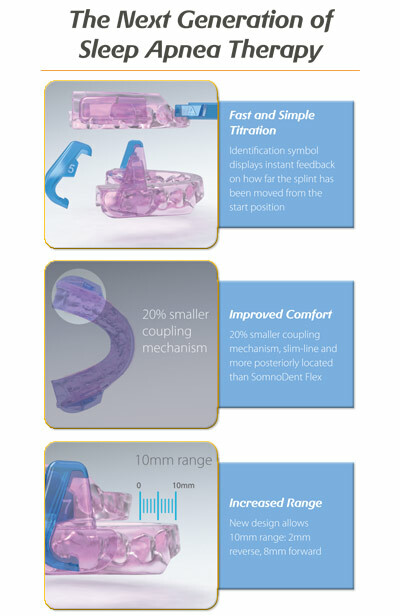 While both will help alleviate your sleep apnea, the G2 is 20 percent smaller and is built to make it easier for your dentist to adjust at your follow-up visits. The SomnoDent will gently, subtly move your jaw forward. How does this treat your sleep apnea? By moving your jaw forward the SomnoDent prevents the soft tissue in your throat from collapsing and obstructing your airway. While wearing your SomnoDent, air will be able to move freely, and the symptoms of your obstructive sleep apnea will be greatly minimized. Patients wear their SomnoDents more than other sleep appliances because it is uniquely constructed to give you a comfortable treatment experience. The device does not lock your jaw, like some other sleep appliances, so you can open and close your mouth at will. That means you can speak and drink as usual. Further, because the SomnoDent is custom made for your mouth, it’s more comfortable than mass-produced sleep apnea treatment options. It does not hurt your tongue and requires no headgear. If you’re a Hoboken or Jersey City resident suffering from sleep apnea, the SomnoDent may be right for you. Contact The Center for Dental Sleep Medicine using the form at the right side of the page or call 201-792-9400 today for a consultation.